When dealing with the loss of someone close, it can be hard to find ways to cope. Designer Alyssa Wasko, however, found her strength through her company, Donni Charm. Donni Charm began from what seemed to be a simple project with Wasko and her mother, but turned into an instant national success. Wasko and her mother started by making scarves for friends. Soon though, they were receiving heaps of requests. They created the Donni Charm in March 2009. Now her scarves are sold in boutiques around the country. The company was named after her late father Donald “Donny” Wasko who past away in August of last year. Her mom had reminded her that she was always his charm, thus the name Donni Charm was chosen. 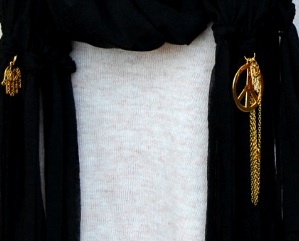 These “classy, comfortable and trendy” scarves are made with 100% cotton jersey, and embellished with bronze, gold and silver charms. Her scarves remind us to keep a close connection with people you love. Each charm represents signs of protection, good luck, and positive feeling. 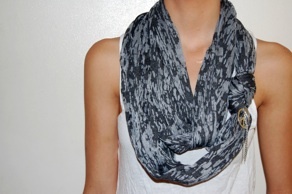 A-list celebs, such as Jessica Biel, Courtney Cox, Taylor Swift and Lauren Conrad, adore Donni Charm scarves. Donni Charm admirers reach international customers in Canada, Spain, Italy and the Netherlands.